For those old enough to remember, the Brady Bunch was a popular sitcom in the early 1970’s, featuring a blended family and their live-in housekeeper. The role of the Brady house was limited to exterior shots only, including the show’s opening and closing scenes; most of the show was filmed on a studio set. The house was otherwise owned and occupied continuously by the same family until it recently sold. 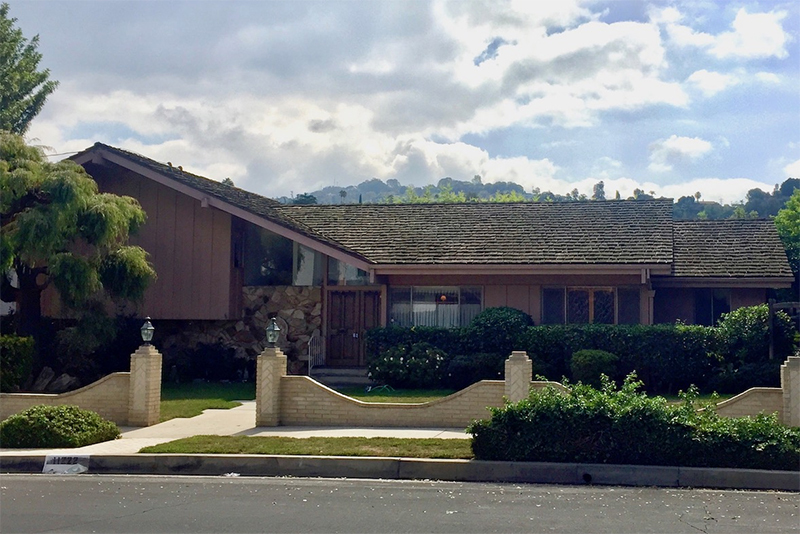 The property is located in an area of Studio City variously known as Woodbridge Park or Tujunga Village; just to the west is the better-known neighborhood of Colfax Meadows. This area has a long connection to the entertainment industry, and is not infrequently used for location shoots (movies and commercials). And the price? A cool $3.5 million, nearly twice the listed price. It isn’t uncommon for homes in this area to occasionally sell above list price, but not by this much. It is rumored to be the second most photographed home in the country (behind the White House), but seriously? Especially considering that the interior of the house wasn’t even used as part of the show. In any event, the price is clearly way above the market based on recent sales. It isn’t necessarily the highest price in the area (including adjacent Colfax Meadows), but everything over $3 million is at least twice the size, and most in this price range are much newer construction. Notoriety definitely commanded a big premium, even though a nearby home where Britney Spears got married several years ago didn’t get the same kind of love. So what is the significance of this aberrant transaction? First, a property’s history can have an effect (a huge effect in this case) on what someone is willing to pay. And that translated into a substantial premium, in contrast to much of the stuff I work on, where extrinsic and/or intangible conditions sometimes have a negative impact on price (crime scenes and haunted houses, for example). Appraisers sometimes debate the impact of a famous architect or owner on the value of property, but the old real estate cliché that “George Washington slept here” seems to apply, even though the Bradys actually never slept in (or occupied) the house. Finally, while this property clearly sold for a huge premium, one has to wonder what HGTV has in store, and how that might affect the neighborhood if the Brady house becomes ground zero for a new reality TV show.